After another huuuuuuge breakfast from Mr and Mrs Prakash, Tai-ji showed up like a 50s sitcom, arms crossed over the Dutch door with a smile saying, "Good morning". With everyone in a great mood, we popped into the car and headed off for some sightseeing in Madikeri and Coorg. First stop was Raja's Seat, a scenic overlook in the mountain hills of Madikeri where breathtaking views and short trails lead to inspirational, gorgeous vistas of Coorg. The location was a famous spot utilized by Indian nobility and dignitatires during the 18th and 19th centuries. Across the street is another temple to get your God on and a Tom and Jerry train should you have a large enough group to fulfill the 10 person minimum. A constant reminder that traditional and modernity are always breaching similar space. Indeed, we'd be sliding in and out of our sandals all days. Walking barefoot into temples, getting blessed and paying the slipper/shoe security guards, became a natural affair to us in the hours that followed. As someone who studied Catholic architecture, spending an entire semester touring Europe's cathedrals and walking across Spain visiting countless more, I find the colorful Hindu temples a breath of fresh air. Unlike, the enormous cathedrals of Europe that seem empty and vacant, even when filled; the quaint temples of India are alive with interaction between the worshipers and those giving the blessings. Growing up Methodist, my family once visited a Catholic church of my uncle and aunt. We mistakenly took communion, which we were later told was forbidden because we weren't "true Christians". However, at every temple I walked into in India, I was greeted with the same acceptance and ceremonious participation as local followers. We were often showed how to pray, given the words to say and wholeheartedly felt a part of something meaningful. I was humbled and truly grateful for the experience. It's important for me to note that Hinduism is incompatible with our Western ideas of beliefs and that doing so leads to false interpretations. What I found is that, it's a way of life, a paradigm (or way) of living to maintain harmony with the universe, otherwise known as dharma. An idea that everything is connected, most importantly souls, and that everyone is welcome. The idols, temples and experiences we share are but representations of the combined significance that make up the un-manifested state. In such a sense, God dwells within us, here. Us, as in everyone. Our next stop was the Omkareshwara Temple drawing it's name from the "Om" sound, it is a beautiful and serene water temple dedicated to the Hindu God, Shiva. Built in 1820, the temple is a mix of Hindu and Muslim styles with Gothic tones throughout. Rumor around town was that the temple was built as an offering to appease the spirit of a Brahmin who was put to death by the king. After Omkareshwara, we headed over to Gaddige, known as Raja's Tomb. 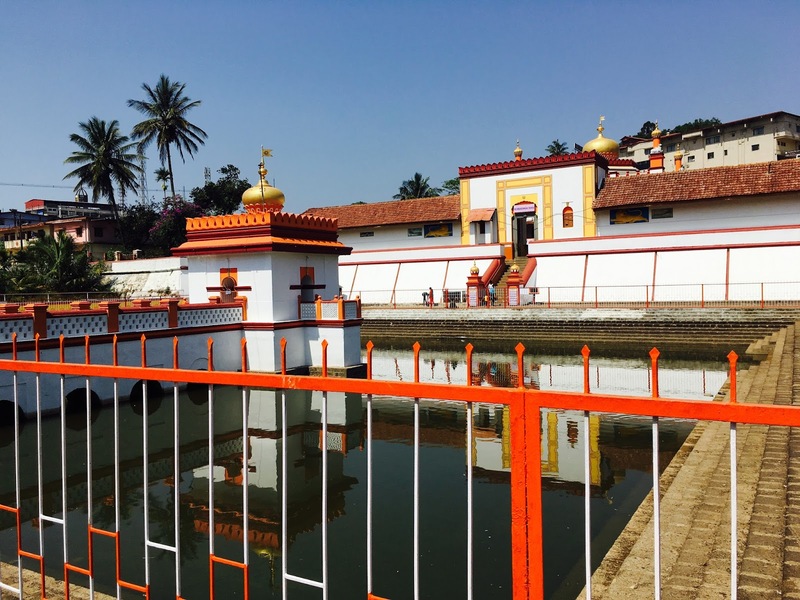 Set on the hillside in Madikeri, the 200 year old tomb contains the mortal remains of the Hindu Kodava king Doddaveerarajendra and his wife Mahadeviamma. Additionally, the king's father, guru, and his two most royal warriors are buried on the nearby grounds. Upon entering the central chamber we were greeted by an apathetic attendant who sat in the brass framed window. He did not move and looked in quite a bit of discomfort as he struggled to ask, "Where are you from?". No longer able to contain himself, he let out a thunderous fart that lasted nearly three-quarters of a minute and vibrated the stone structure with an echo of biblical proportions. I tried to pretend it didn't happen and there were no apologies from him. "Sign the book please", which I did cautiously, while simultaneously holding my breath. He continued relieving himself while answering his phone. I questioned if the man would need medical help, but he seemed at ease with the notion as if it was policy to greet each guest with his haunting special effects. As one human-being to another, I understand the biological needs we all (regardless of our own denial) have from time to time, but this man had talent in ways with which no words can accurately describe on paper. What should be a somber, reflective place was feeling more like a scene from the movie Mummy. Next we went to Abbey Falls (or Abbi Falls), part of the river Kaveri surrounded by jungle and coffee plantations. A mammoth and powerful waterfall that has claimed over fifty deaths during the rainy season. Our visit resulted in a more tamed waterfall. 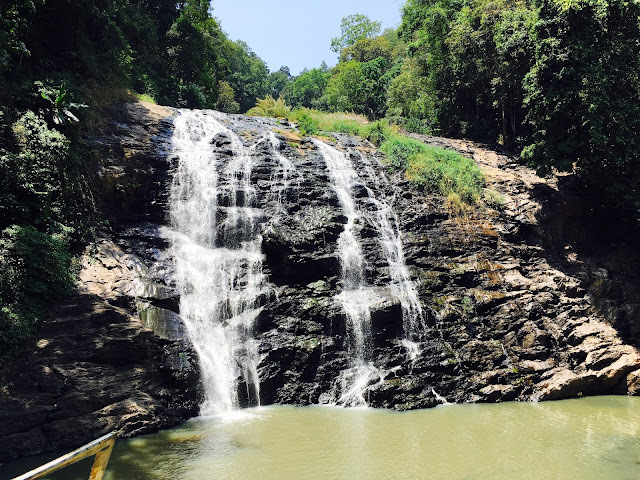 Originally named Jessi falls during British occupation, I'm told the current nomenclature comes from the Coorgi word (the dialectal language of Coorg), abbi, meaning waterfall. So it's literally, Waterfall Falls, much like Chai Tea is tea tea (Chai meaning tea in Hindi). Think about that the next time you're at Starbucks and some snoody American orders tea. The pathway down to the falls is steep and dangerous (though they appear to be modernizing this) and I had quite a calamity with regards to wearing flip-flops that day. However, it was all worth it for the most beautiful view. The foot bridge that was so popular to stand on in the past, where tourists loved to be splashed by the falls, is closed with no indication it may ever be reopened. As of a few years ago, you could actually go down into the water but it appears that even here in rural India, the tourist attractions are becoming sanitized safe-zones void of interaction. Depending on your opinion on the matter this could be good for the environment but is also severely cauterizing the aspects of adventure tourism with which India has been known for in the past. The day was only half way over and we had already accomplished so much. With Tai-Ji in need of a midday break, it only made sense to head back to the plantation for a bit of relaxation before our drive up the mountains to the Buddhist Temple high above the clouds. We stopped at my favorite coffee shop before heading back and I picked up some onion bhaji (fried onion fritters) for a quick snack. Not forgetting Blacky, I got him a bag of banana chips and we enjoyed a relaxing afternoon back at the tent. We had done and seen so much, but the best was yet to come. Want to read about the rest of the day? Continue Reading: Celebrities at Talakaveri, I hate you like I love you. Read Part III: Balance in India: What begins must end. - Cubbon Park, Commercial Street.